Allergies taking a toll on you? Constant sneezing and itching can deter from affection you’d like to give cats. You’re not alone. In fact, people are twice as likely to have cat allergies than dog allergies. Still, furry felines are hard to resist. If you’re still longing to have a cat, there are some “hypoallergenic” breeds known to produce fewer allergens than other cats. Keep in mind, no breed is completely non-allergenic but a different choice in breed may cut down on adverse reactions. Ever wondered what causes the allergies you suffer from? It’s not the cat’s fur, it’s actually a protein called Fel D1 found in cat saliva that causes you to sneeze and feel itchy. Once a cat licks their coat, the allergen-laden saliva dries and becomes airborne, increasing likelihood for a response. There are a variety of cats that produce fewer allergens and can make pet parenting a bit easier. This “hypoallergenic” cat list should not be the only thing you consider when researching which breed of cat to adopt. The best way to determine if you are sensitive to a cat is to meet him or her. We recommend contacting an animal shelter or rescue group and arranging to meet the pet before making a decision. Often referred to as the “longhaired Siamese,” the Balinese looks like an unlikely candidate for a hypoallergenic cat breed. But it is one of the few breeds that produce less of the Fel D1 protein than other cats, thus causing fewer allergic reactions in allergy sufferers. 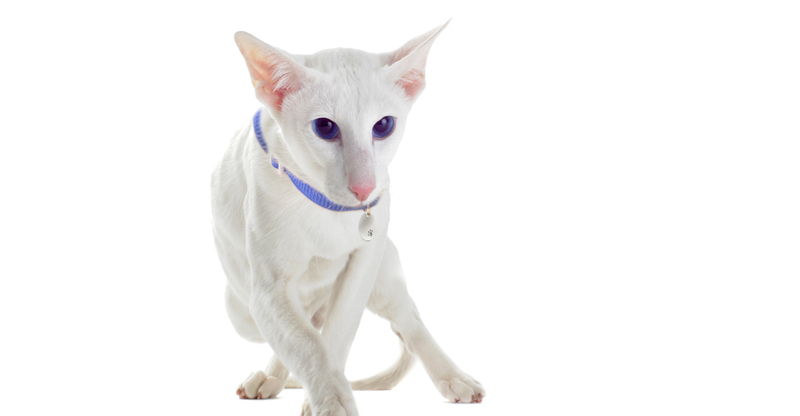 Balinese cats are smart, sweet, and fun to be around. Like the Siamese, they are known for their ability to communicate vocally. Highly social, Balinese are sensitive to your mood and are more than willing to cheer you up with some happy chatter if you’re feeling gloomy. They are considered non-allergenic cats, but it’s still a good practice to groom your Oriental frequently to keep dander to a minimum. The personality of the Oriental is as distinctive as their coat. They are natural entertainers, full of enthusiasm, and love being the center of attention. Conceited one minute— animated and inquisitive the next. They are highly curious and will go to great lengths to be involved in your activities. Like the Balinese, the Javanese sports a medium-long single coat that doesn’t mat. Because of the lack of undercoat, they have less fur, which translates into fewer allergens. Javanese cats are devoted, intelligent and known for their communication skills. They have a fascination with food and tend to burn off extra calories in playful antics. This breed is perfect if you want a responsive cat that’s easy to train and likes showing affection by purring in your ear and following you around. Of the two Rex cats, the Devon has both shorter fur and less fur. 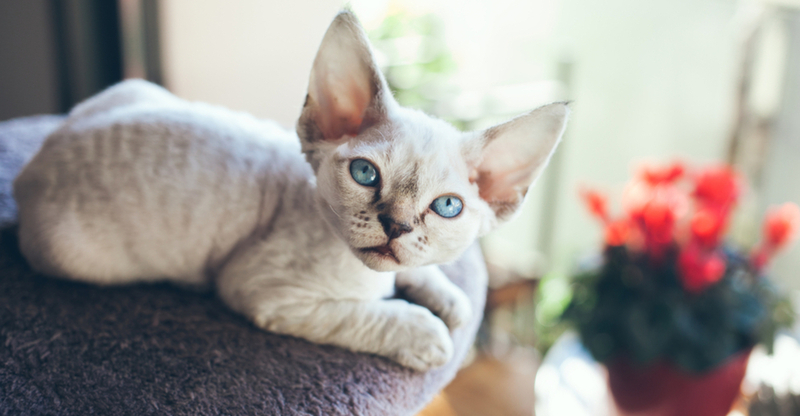 Your Devon Rex will need to have her paw pads and ears cleaned of oil build-up frequently, but doesn’t need frequent full baths like the Sphynx or Cornish Rex. Devons have been compared to elves and space aliens for their jumbo satellite-dish ears, large, mischievous ‘window-to-the-soul’ eyes, and ethereal appearance. They’ve been known to cuddle up with you at night and wake you in the morning with kisses and purrs of affection. And since the Devon sheds less than other breeds, you can snuggle back without fear of covering yourself in cat hair. The Cornish Rex requires more upkeep than the Devon because they require frequent baths to mitigate the oil buildup on their skin. Cornish Rexes are active, inquisitive, gazelle-like felines that have a playful temperament. Everything is a game to the Cornish Rex, and they can be hard to ignore when they’re in a sociable mood, which is most of the time. Rexes are determinedly outgoing and loving towards their favorite humans. With their warm suede feel, they make the perfect winter lap warmer, too. 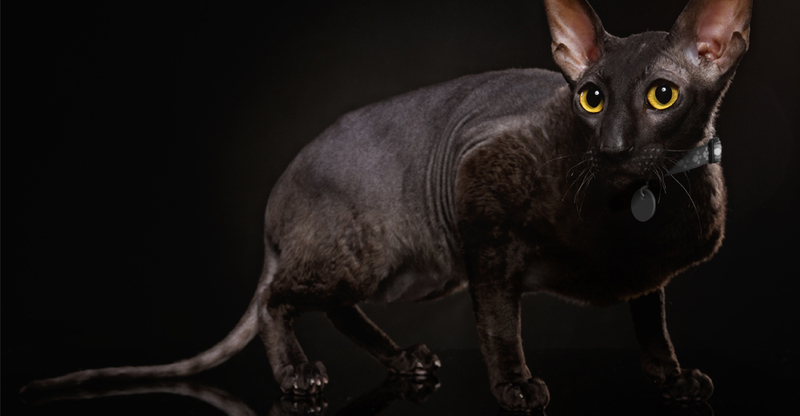 Both the Devon and Cornish Rex can be the best cats for allergies, choose one that matches your personality. The hairless Sphynx is the cat most often associated with being a hypoallergenic cat breed. Being hairless does not mean they’re maintenance-free, however. 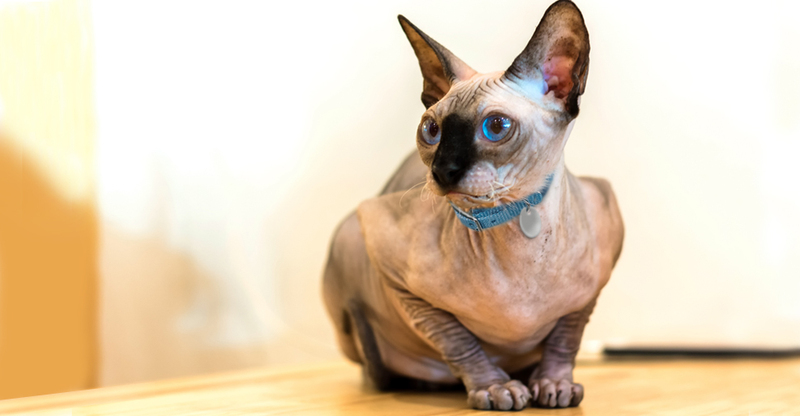 Your Sphynx will need frequent baths to remove the gummy buildup of oils on her skin, and their large ears will also require frequent cleanings. According to the French breed standard, the Sphynx personality traits are often compared to dogs children based on its animated nature. To say Sphynxes are lively is an understatement; they’ll keep you entertained performing aerialist feats from the top of doorways and bookshelves. Very devoted and loyal, they follow their humans around, wagging their tails doggy fashion and purring with affection. Like the Balinese, the Siberian sports a moderately long coat, but still is hypoallergenic due to the lower-than-average enzyme levels in their saliva. Some claim that 75 percent of cat allergy sufferers have no reaction to the Siberian. Siberians are affectionate cats with a good dose of personality and playfulness. They are open to handling, and have a fascination with water, often dropping toys into their water dishes or splashing in bathtubs before they’re dry. Siberians are intelligent, with the ability to problem-solve to get what they want. Despite their size, they are very agile and are great jumpers, able to leap tall bookcases in a single bound. Adopting a “hypoallergenic” cat may not be a total cure-all but you can hopefully relax and breathe a bit easier. Try spending time with a cat of the same breed you’re interested in and see if your allergies remain in check. Frequent Baths and Brushing: If you’re allergic to cats, the process is best left to a groomer or family member. Research has proven that regularly bathing your cat can help remove up to 84 percent of existing allergens and reduce the future production of allergens. Some claim that using distilled water in the bath may also reduce allergen levels. Wash Toys and Cat Bedding: Washing toys and bedding also reduces the number of allergens floating around your home. Do this at least once a week. 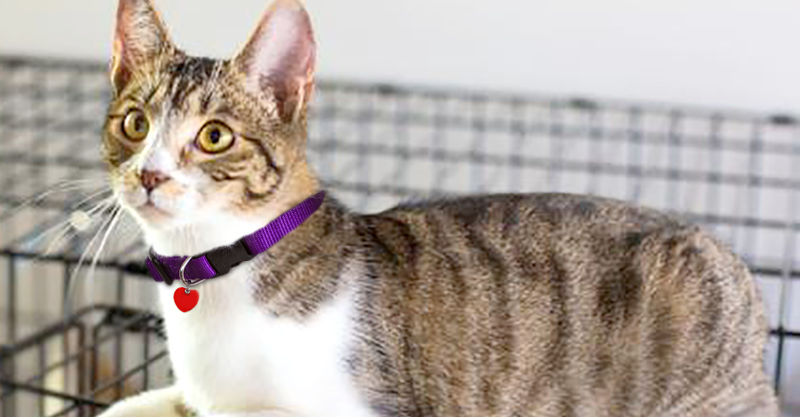 Find hypoallergenic cats for adoption near you. 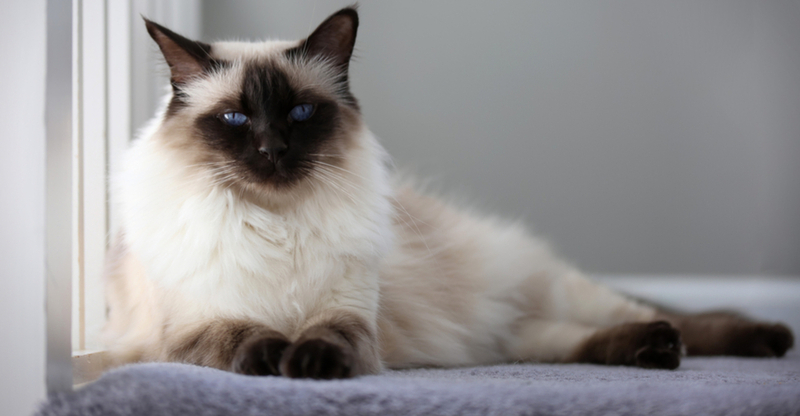 Balinese is one of the few breeds that produces less of the Fel D1 protein than other cats, causing fewer allergic reactions in allergy sufferers. Considered non-allergenic cats, it’s still a good practice to groom your Oriental frequently to keep dander to a minimum. Javanese sports a medium-long single coat and no undercoat, that means they have less fur, which translates into fewer allergens. Devon has both short fur, and less of it, which means she sheds less than other breeds; so, snuggle up to this naturally affectionate cat. The Cornish Rex requires frequent baths to mitigate the oil buildup on her skin, which makes has a warm suede feel – perfect winter lap warmer. Being hairless does not mean the Sphynx is maintenance-free, she’ll need frequent baths to remove the gummy buildup of oils on her skin. 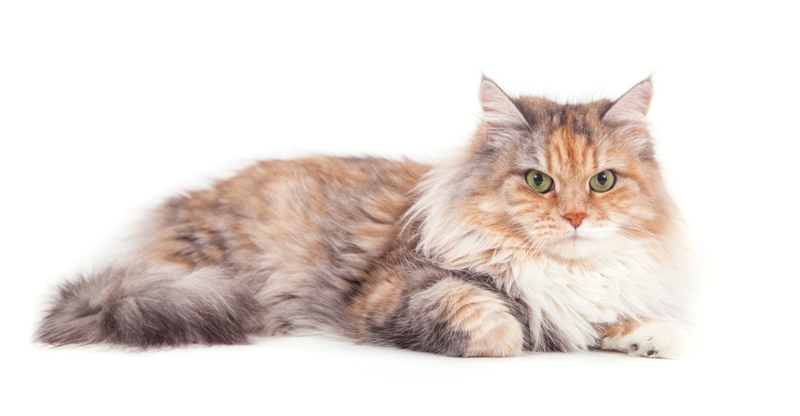 Siberians sport a moderately long coat, but is still hypoallergenic due to the lower-than-average enzyme levels in her saliva.